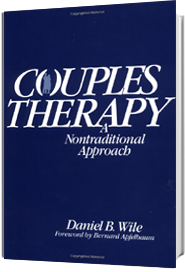 When I double in couple therapy, I serve as each partner’s spokesperson, scriptwriter, and advocate—their Cyrano de Bergerac—finding words for what they had been struggling to say or recasting what they did say to make it more heartfelt. I show how it might sound were they to speak from a place of greater vulnerability and generosity of spirit. People generally welcome my efforts to speak for them. When I get out of my chair and kneel next to a partner, decreasing our physical distance, some of our emotional distance disappears also. Moving close to a partner can create a mysterious intimacy. The partner softens and, in response, I do, too. Suddenly, I have a more palpable sense of that person’s struggle. We work together to come up with a statement that better communicates how she or he feels. I’m showing how it would look if the partners were having a conversation rather than a fight—an exchange in which each partner makes acknowledgements, looks at things from the other’s point of view, and engages in a kind of informal active listening. If partners are caught in an intense, going-nowhere fight, I may double after practically every comment either of them makes. In most sessions, however, I double less than half a dozen times and often only once, twice, or not at all. The following are examples of the reasoning I use in deciding to double at a particular moment. They’re doing fine, but I think I have a way to take things deeper. This fight is escalating and I have to do something. Mel’s the more upset so I’ll go over and speak for him. I’ve only the inkling of an idea of what to say, so I hope it takes shape by the time I get over to him. There’s something conciliatory in what Elena just said, but Barry obviously missed it. I’ll repeat what she said in a way that emphasizes the conciliatory element. Uh-oh, I’m getting caught in Sam and Joellen’s depressed mood. I’m fading out along with them. Okay, I’ll speak for each and try to inject some spirit into this room. This first session is nearly over and I haven’t yet doubled, which I need to do to give them a sense of what therapy with me would be like. The following are examples of the reasoning I use in deciding at a particular moment not to double. They’re doing fine. I can’t think of anything to say for them that wouldn’t just get in the way. They’re having trouble, but I can’t think at the moment how to intervene. I hope something occurs to me soon. It usually does. They’re doing wonderfully—coming up with better things than I could think to say for them. I’ll just listen. Afterwards I’ll comment on the great conversation they were having. I’ve been doing a lot of doubling, but I can’t tell for sure whether it’s helping or just getting in their way. I’ll back off for a while and see what happens. WHERE AM I RIGHT AND WHERE AM I WRONG? 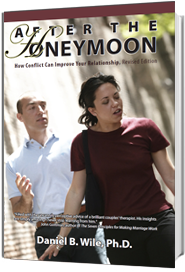 I look forward to reading your chapter and your book, and may assign the chapter in the class I’m currently teaching on couple therapy. Well done! Dan, it’s lovely that you share your own thoughts and uncertainties–makes this reader soften. Nice explanation of why and when you do and don’t double for clients. I like how you share your uncertainties too, which we therapists can all relate to. This is a lovely description of your work helping partners soften and speak so the other can hear. I especially like how you link vulnerability with generosity of spirit…Thanks for your ongoing insights! Hi Dan, agree with what you’ve written about acknowledgment of the other’s point of view. Beginning statements with positivity or an expression of understanding helps more than one can imagine. In an argument, it’s easy to feel wronged or misunderstood. 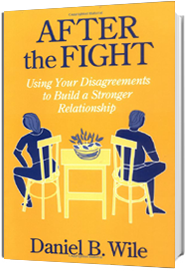 Statements like “You’re right about this….” Or “I understand how you might feel” can change reestablish the connection. I am very sympathetic to your argument for doubling as a form of therapeutic conversation, perplexity, and education. Your strategy of changing places and shifting perspective in order to establish the precondition for a conversation of intimate distances gets the rhythm of your method and approach just right. BUT I do not think we are doubling because speech and voice are multiple—there are numerous exchanges going on with the larger therapeutic situation and outside it and in the particular moments of that situation. (Think of how Socratic philosophy is shaped by historical context and material moments). My uneasiness with doubling is that it simplifies the dynamic between the single double and multiple. In other words, we have several aspects within a single point of view. For Socrates we are always saying more and less than we know about ourselves and the various contexts that shaped the self. Every claim, choice of life, and action reveal an ideal of goodness beyond the command of consciousness. If so then the idea of what is exactly right and the idea of final arbiter become problematic.